Around 750 participants from 74 countries actively took part in information exchanges and interaction using theme forums, paper and poster sessions, workshops, panels and roundtable discussions, peka kucha, world café, practitioner exchanges and informal talking. New Zealanders participation included presentations on assessing the health of the mauri in areas surrounding the Rena wreck, impacts of deep sea mining, water management in the upper Waitaki River catchment, and leadership in the sessions of the Indigenous Peoples Section. The full programme addressing the conference themes is available online and proceedings will be available in due course. The programme demonstrates the wide interests in IA amongst participants, and especially in the East Asia region. The NZAIA poster drew interest in explanation of the use of teleconferencing for core group meetings, cloud/google documents, facebook and our website. (This is not a posed picture and permission was sought). 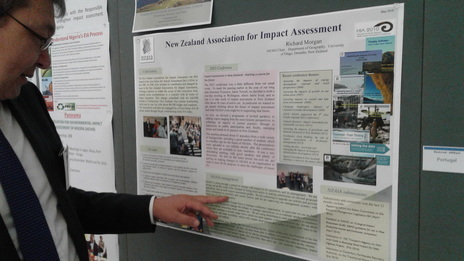 The EIANZ section on impact assessment also had a poster incorporating our logo as their associate. They are preparing for a probable IAIA conference in Brisbane in 2019. The Affiliate/Associate business meeting included representatives from affiliates in South Africa, Quebec, Korea, Iran, Turkey, Australia, California, New Zealand, Ghana and Nigeria. We discussed future communication on responding to changes to EIA legislation that has become ‘outdated’, meeting the challenges of administration and communication in our different places, having goals and systems which reflect our varying size and resources, and having more active communication between affiliates throughout the year and up to the next conference in Montreal, April 2017. New Zealanders and Australians at the conference showed interest in the upcoming NZAIA conference in December and keeping in contact with NZAIA.